machines or heavy equipment that you need to move? machinery or production lines that need to be dismantled or removed from their current location? machines that need to reassembled? 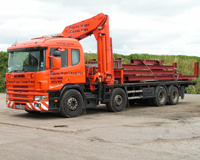 South West Crane Hire have a very experienced and highly trained team of fitters who are capable of dismantling and removing machinery, jacking and skating (the actual removal of machines from your premises), transportation and reassembly of your machines at your destination premises. If you would like further information or professional advice regarding any aspect of your machinery moving requirements then please Contact Us and one of our advisors will call you back . Site survey to confirm access for lorries and machinery moving equipment, scope of the project and dimensions and weight, if possible, of items to be moved. Confirmation of any special requirements. Jacks and skates etc as required to carry out the move. We have a range of vehicles with lifting arms or flat bed trailers that can cope with the transportation of the heaviest and largest objects. We are fully insured for all stages of your removal, from dismantling through transportation to reassembly. Having been in the Machine Moving and Removal business for over 35 years, we have attended to all types of machinery moves from small item dismantle and moves to large scale commercial projects. No machinery move is too small or too large and a professional machinery moving service is guaranteed every time. Contact us today to discuss your Machine Moving Crane Hire requirements.